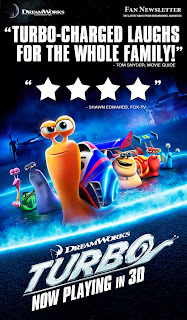 In the delightful 3D animated film, “Turbo,” Ryan Reynolds stars as a snail with an extraordinary dream: he wants to be fast. Very fast. It’s a contradiction in terms but that doesn't stop this tenacious creature from pursuing his ambition. Despite a series of obstacles along the way, (including opposition from his own brother, played by Paul Giamatti) the turbo-charged mollusk enlists the help of an unusual crew of supporters who cheer him on. 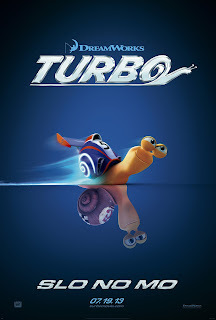 “Turbo” is the story of an unusual hero, an ordinary garden snail with big dreams. He may be one of the slowest creatures on the planet but he longs to be fast, speedy enough to win a legendary car race. With heart-stopping action and lively characters, the family film from DreamWorks Animation and Twentieth Century Fox centers on the engaging Theo (he changes his name to Turbo) ,voiced by the talented Ryan Reynolds, who lives in the yard of a house in Southern California. He sneaks into the garage at night to watch racing on an old TV set and is obsessed with French-Canadian world champion,Guy Gagné, (Bill Hader) the five-times winner of the historic Indy 500: [The Indianapolis 500-Mile Race] one of the world’s most prestigious car races that is held at the Indianapolis Motor Speedway. The fact that the race is for cars not mollusks is irrelevant to the tiny creature. Turbo has a clear vision, although like every underdog (or under snail) he faces a series of formidable obstacles along the way. It seems like a ludicrously impossible goal, but Turbo’s adventure kicks into high gear on the freeway in Los Angeles when a freak accident gives him the power of super-speed: he can travel at 230 miles per hour! The turbo-charged snail embarks on a thrilling adventure, assisted by a crew of racing snails anda few human characters too. His cautious brother Chet (Paul Giamatti) believes Turbo should stay at home with his family and forget the whole idea. The intrepid snail remains undeterred. “Turbo is a guy who sees himself on the wrong side of destiny. Unfortunately he's a garden snail. And garden snails usually fail to register even the tiniest blip on the spectrum of greatness. Turbo is completely disillusioned with his lot in life and with the perception of his life as ‘ordinary’. He sees himself as a guy who is on the very cusp of true greatness. He views himself not just as the fastest snail on earth, but the fastest anything on earth,” explains Reynolds of his character. “Turbo” is now playing in theaters nationwide from DreamWorks Animation and 20th Century Fox distributed by Warner Bros. in the Philippines.